One of Word’s features with which I have a love–hate relationship is the Symbol dialog. I am sure there must be a rationale for where symbols are placed in the various categories, but it escapes me. 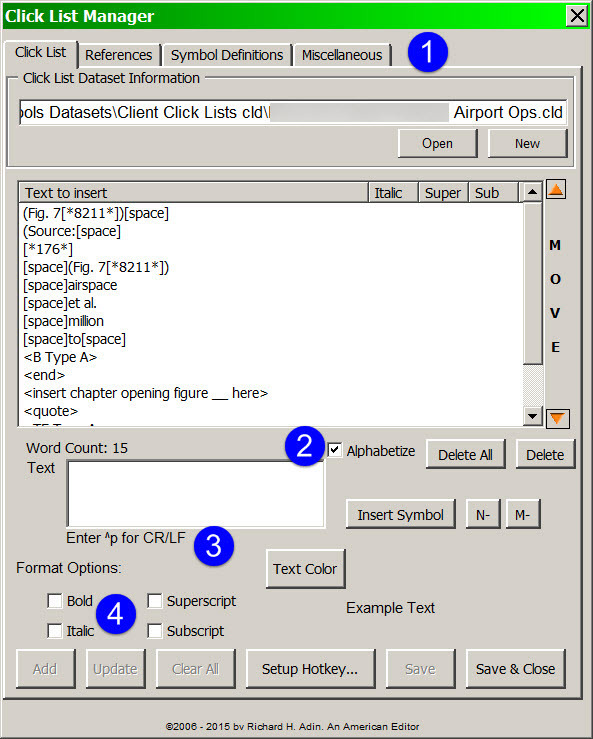 Dealing with the Symbol dialog was one of the impetuses for the creation of the original Click List macro in EditTools. Needless to say, although the original Click List was helpful, it was problematic to remember that [*8214*] meant a double vertical line. And as my list of symbols grew, it became apparent that some other system was needed — I was neither saving time nor making money by using Click List (in its original incarnation) for symbols. Then I had a project where the author kept reusing the same basic references (134 of them) but didn’t style them the same way twice. So, I thought, this could be a great use for Click List. And I started adding the references in their correct form to Click List. The result was unusable if efficiency was my goal — I was trying to add to a single Click List too many disparate items, which made it hard to find specific items. 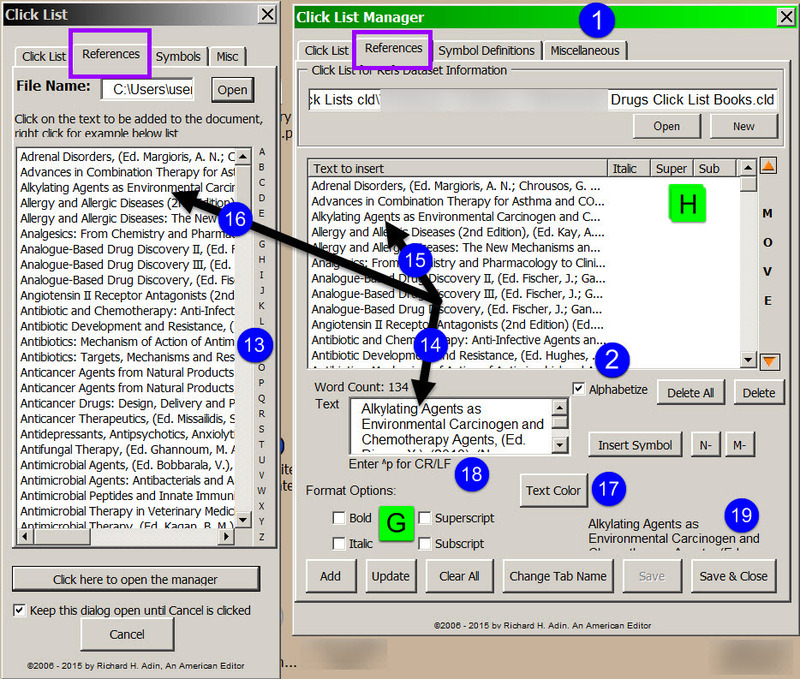 This approach was contrary to the approach I was using in other EditTools macros, which was to have multiple tabs so that data could be better organized and managed; consequently, it became evident that I needed to add tabs to Click List. Instead of one tab for everything, there are now four tabs (#1 in above images) — three of which can be renamed (the Click List tab cannot be renamed) — one of which, Symbols Definition, is specifically designed to deal with Word’s Symbols. Each tab has its own dataset (#C above and below), so each list is independently maintained. 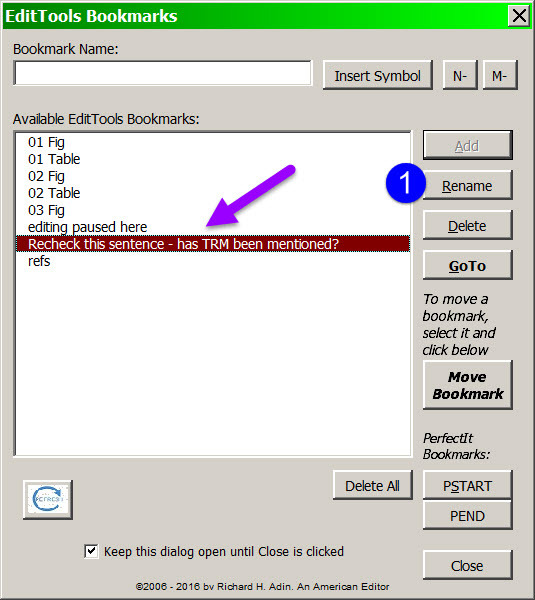 The Symbols Definitions tab in Click List Manager is shown above. The Symbols tab in Click List is shown in the Click List image above. 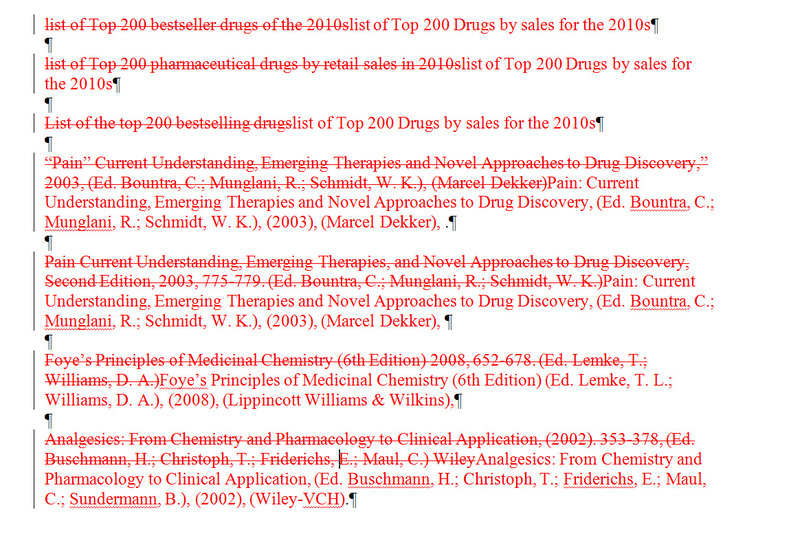 Note that there are 30 entries in the list (#D). Under Word’s system, it would be difficult to access some of these symbols quickly. 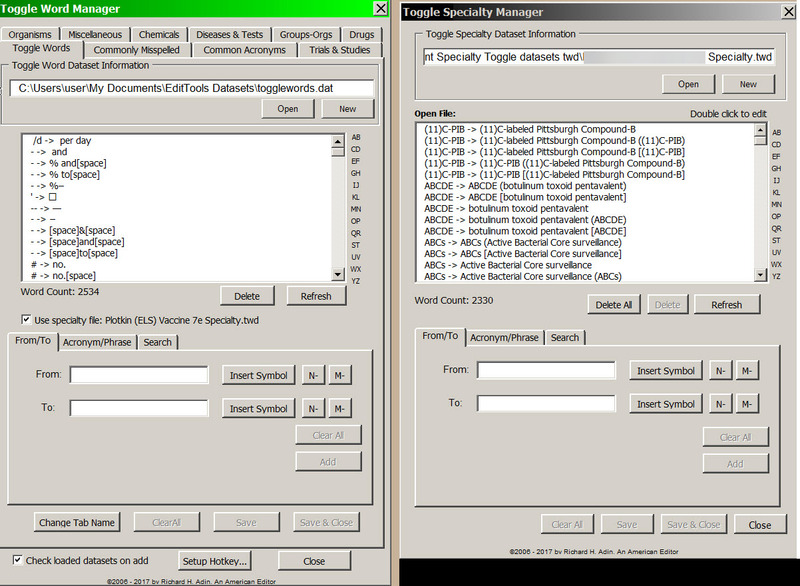 In addition, Word requires multiple clicks each time I want to access a symbol: (1) to switch to the Insert menu, (2) to open the Symbol dialog, (3) to open the More Symbols dialog if the symbol I want is not on the short “quick access” list, (4) to scroll (or to select the group, if I know which group it is in, from the dropdown) to find the symbol I want, (5) to select the symbol, and (6) to insert the symbol into my document. 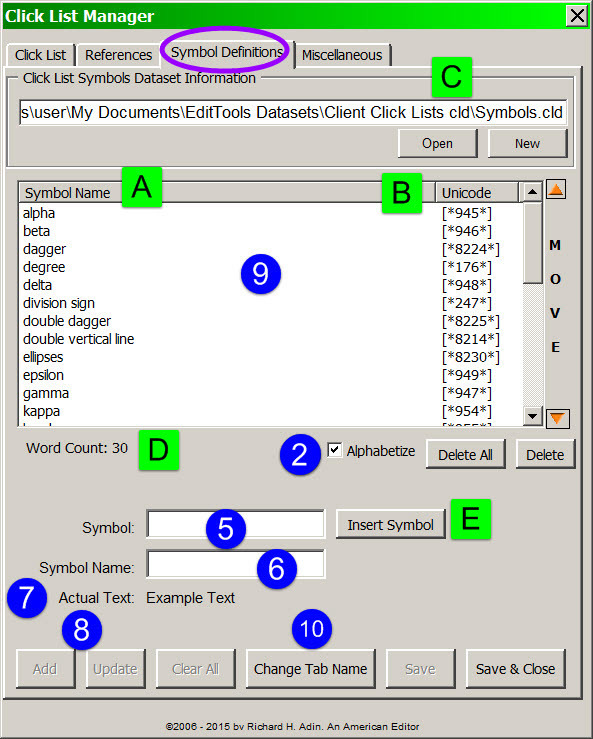 In contrast, with Click List, once I use the Manager to add the symbol to Click List (the Manager can be opened from the EditTools toolbar or by clicking the button in Click List [#11]), it takes three steps: (1) a click to go to the Symbols tab if it is not already showing (assuming Click List is already open; the way I work, I open it when I start Word and keep it open until I close Word or click Cancel [#F]), (2) scroll to locate the symbol by the name I have given it, and (3) click on the name to insert the symbol in my document. Half the steps plus significant time saving in locating. The Reference tab is the same as the Click List and Miscellaneous tabs, but if you compare it to the Symbols Definition tab above, you will see some significant differences. 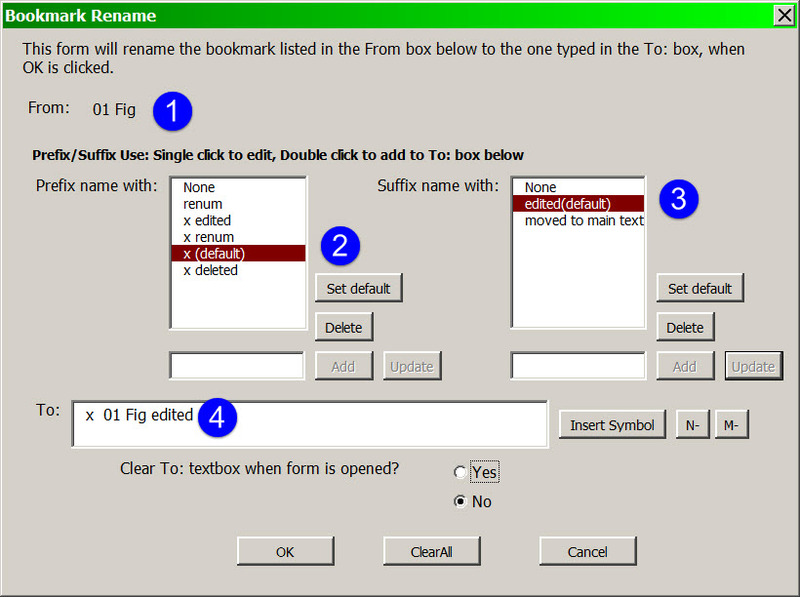 For example, the Format Options (#G), the Text Color option (#17), and the ability to add a Return to an entry by typing ^p (#18) are not available in the Symbols Definitions tab. In the project, the author would cite a book or a chapter in a book, but do so inconsistently. 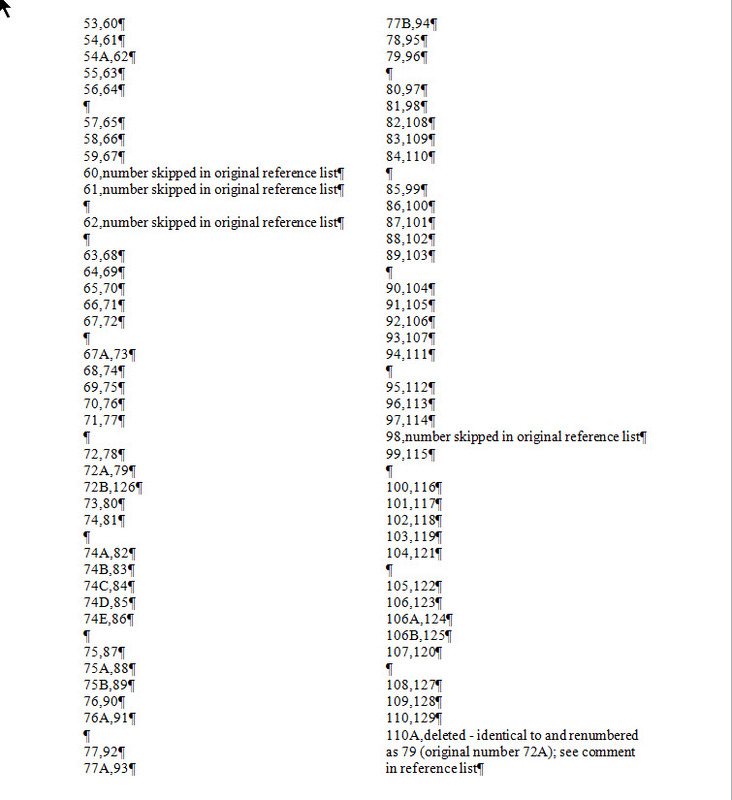 So when I initially came to a reference, I corrected it and I then copied the “fixed” portion (i.e., the portion of the reference that would remain the same in any future use of the cite) of the corrected version into the Text field (#14) of the Manager and added it to the list (#15) by clicking Add. I did not apply any of the Format Options (#G) because they apply to the whole text string, not just to select words in the text string. 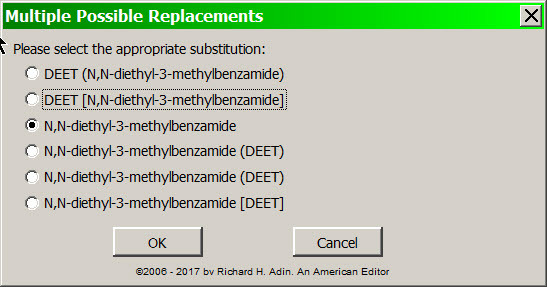 Because Alphabetize (#2) is the default, clicking either Save or Save & Close added the cite to Click List (#16) in alphabetical order. 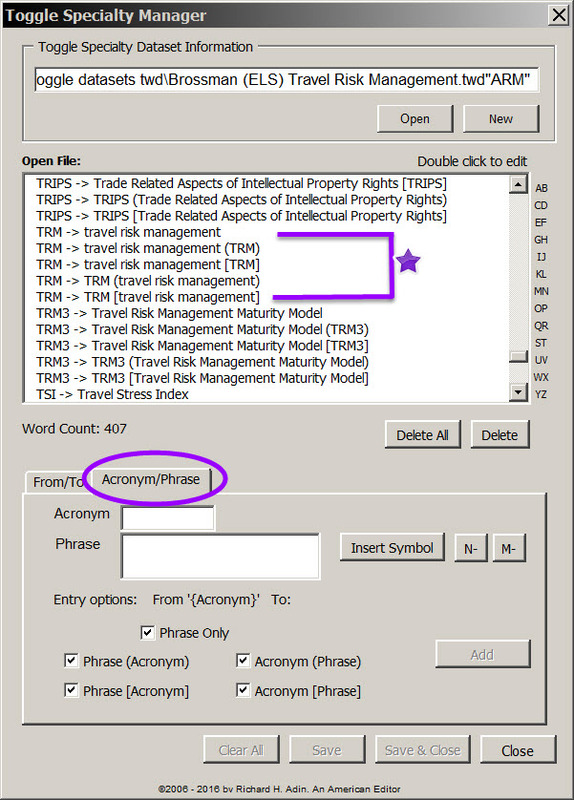 When I came to a reference entry in the document, I checked for it in the Click List using the ability to go to a particular letter in the alphabet by clicking on the letter in the Alphabet (#13). 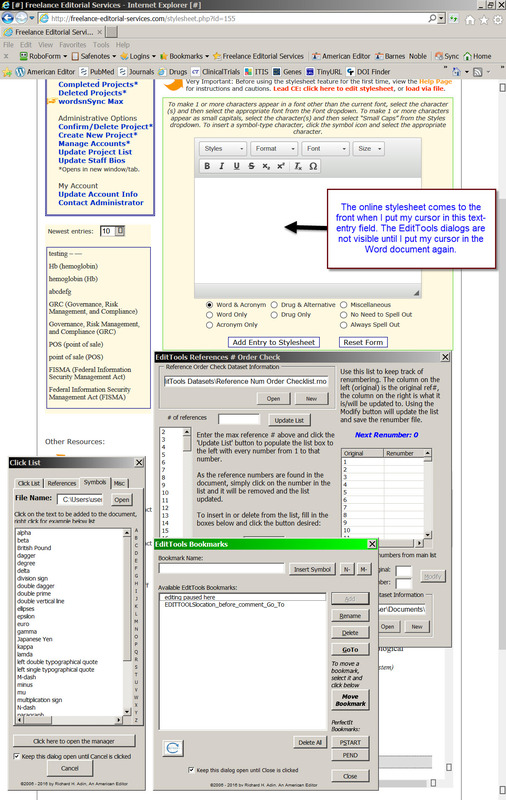 If it was present, I then selected the incorrect “fixed” portion of the cite in the document and clicked on the correct “fixed” form in Click List to replace the selected text. Dunn, P. J., The chemical development of the commercial route to sildenafil citrate, (Ed. Gadamasetti, K.; Braish, T.), Proc. Chem. Pharmaceut., Ind. (2008), 267-277. Dunn, P. J., The chemical development of the commercial route to sildenafil citrate, Process Chemistry in the Pharmaceutical Industry, Volume 2: Challenges in an Ever Changing Climate, (Ed. Gadamasetti, K.; Braish, T.), (2008), (CRC Press), 267-277. 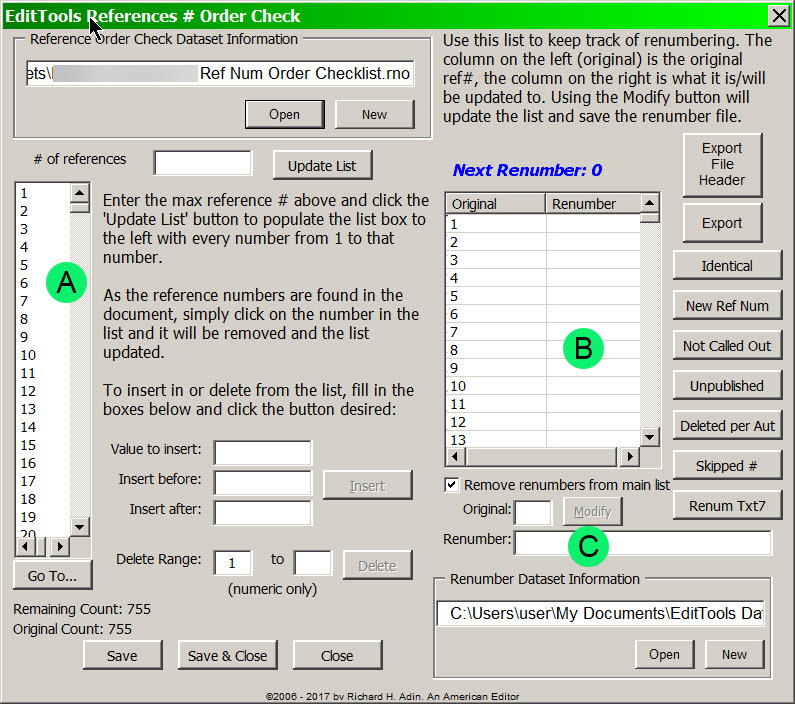 A lot of typing (and repeat typing) was saved by using the Reference tab of Click List. And because the reference list I created could be saved to a project-specific dataset, I can recall this list when I edit the next edition of the book. 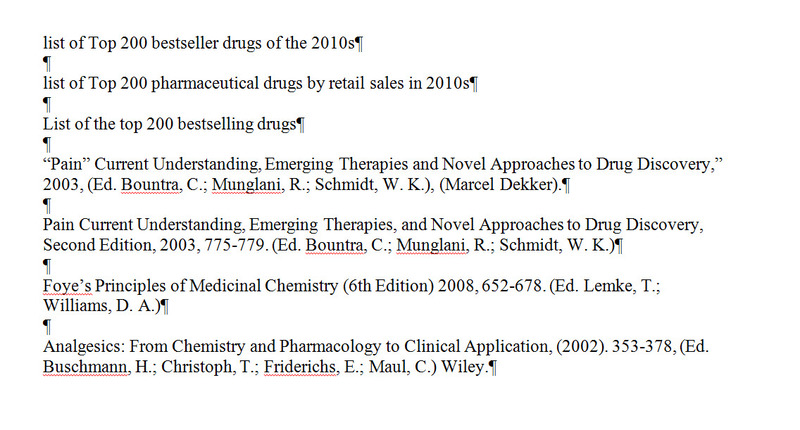 If the format had been a standard style, such as AMA or Chicago, I could have saved the list as a style-specific list, for example, as “Chicago Style Drug References,” and used it (and added to it) the next time I had a project calling for that style in the same subject area. I found that as my Click List datasets grew, it became difficult to quickly find a specific entry. This was especially true with the Symbols and the References tabs. 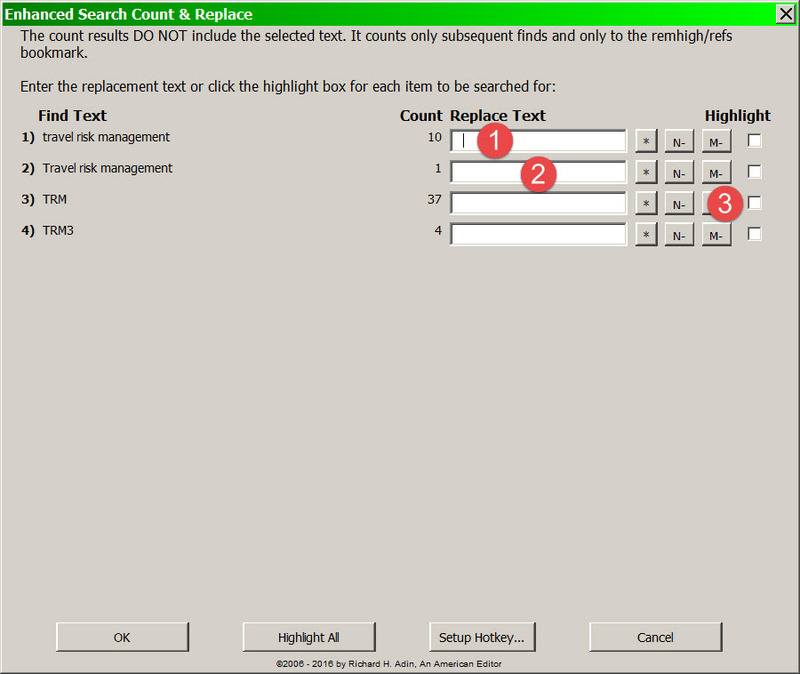 The result was the Alphabetize option (#2) on Manager and the Alphabet go-to function (#13) on Click List. Clicking on a letter of the alphabet takes you to the first entry that begins with the selected letter, eliminating a lot scrolling in long lists. The EditTools 7 Click List is an excellent way to save time and increase profits. I use it to insert specific text that a client requires (e.g., copyright lines or permission lines) and anything else that can be standardized. Remember that Click List and Toggle Word are complementary. Click List inserts new text; Toggle Word changes existing text. Using both significantly increases efficiency and, thus, profitability. As you know, my mantra is that every second counts and the more seconds I can save by increasing efficiency, the more profitable my editing will be. One drag on time is typing — the more typing I do, the more time is spent doing it and correcting it. 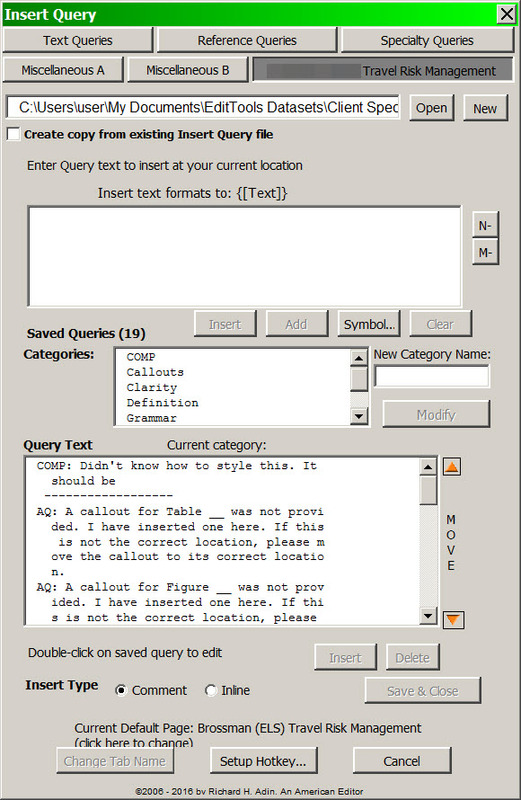 But Toggle Word only changes exact existing text; I can’t put my cursor in a blank space and have Toggle Word insert the correct text nor can I use Toggle Word to change a word or phrase that doesn’t exactly match what is in its dataset (e.g., if the dataset includes “about” but not “About,” Toggle will only change “about”). To remedy this omission, Click List was created. Click List is a complement to Toggle Word: Toggle Word replaces text, Click List inserts text or replaces selected text (see “An Example From a Recent Project” below). 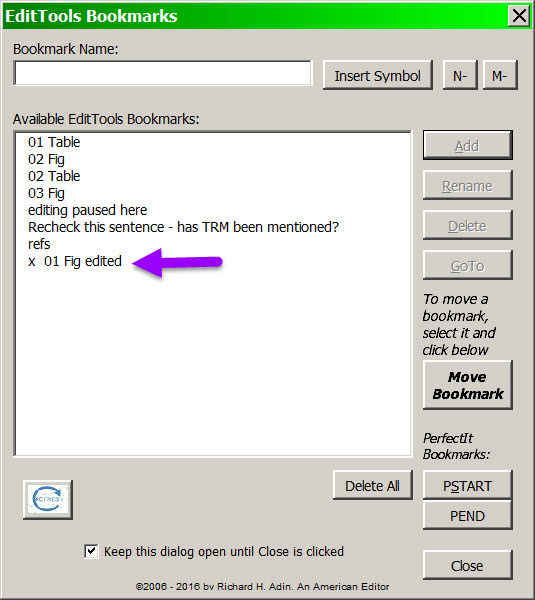 Click List and its Manager are found on the EditTools tab (A). 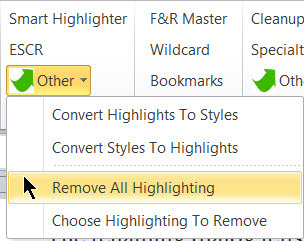 Like other, macros in EditTools, it can be assigned to a Hotkey combination either from the EditTools ribbon (B) or by Clicking Setup Hotkey… on the Click List Manager (see #1 in the Overview below). Like many of the macros in EditTools, Click List can be a general list that you use all of the time or it can be a specialty list, for example, one for a specific project. You either open an existing Click List file or create a new one (#2), just as with Never Spell Word, Toggle, and other EditTools macros. 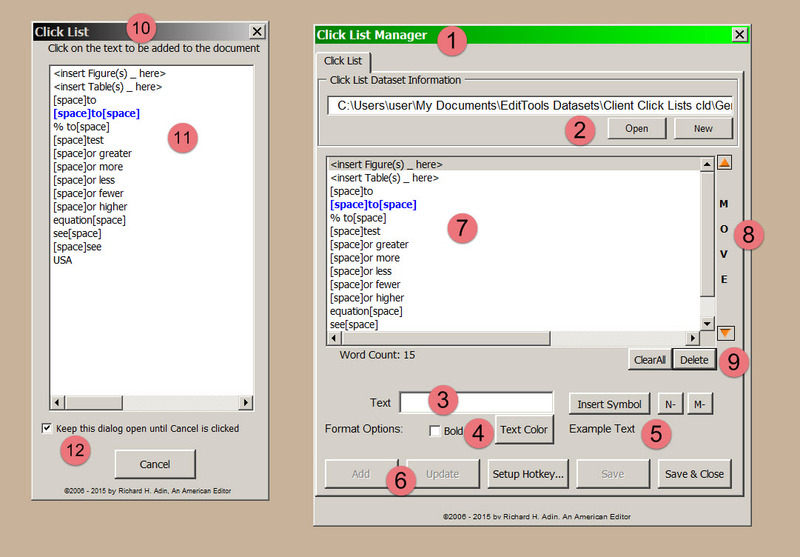 In fact, the Click List Manager works much the same way as the other Managers do, with a few exceptions. 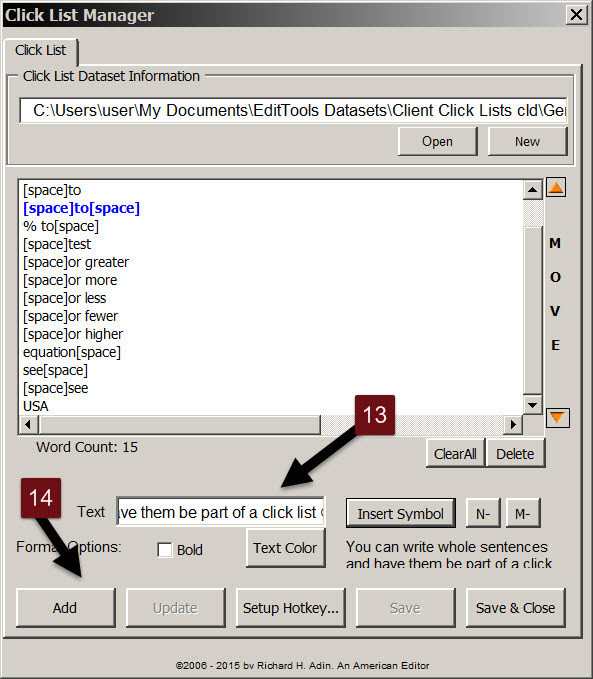 Click List enables you to insert items into your document with a single click. It can be a word, a short phrase, or even a paragraph of text. Click List is intended to make editing a document quicker, easier, and more accurate. 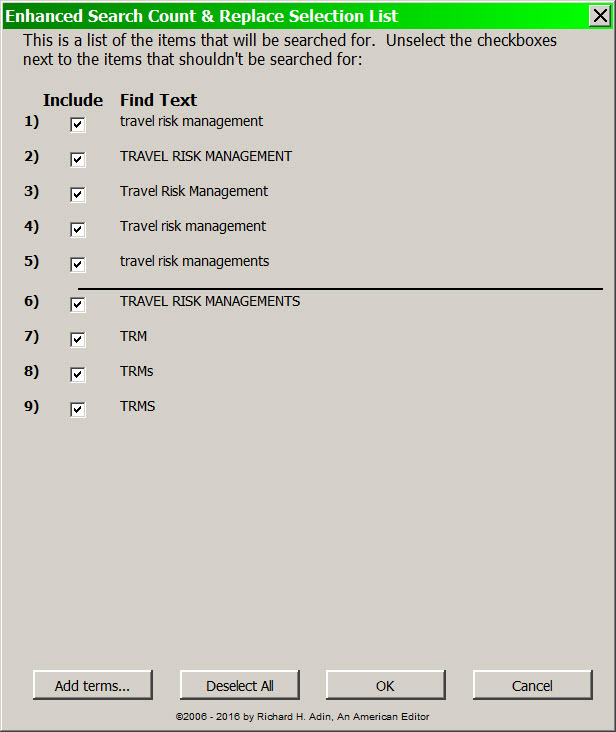 The text appears in the Manager’s display field as shown below. Here a sentence was added, “You can write whole sentences and have them be part of a click list” (#15). 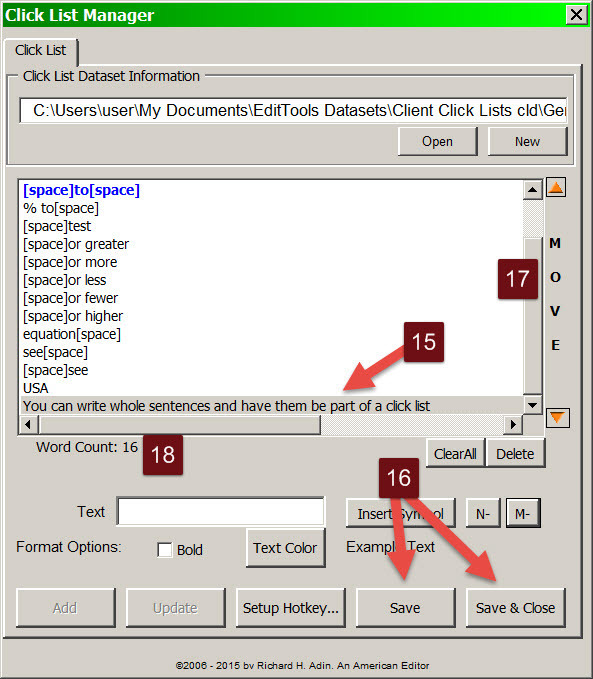 However, to add the sentence to the Click List so that it can be inserted into your document, you need to click either Save or Save & Close (#16). 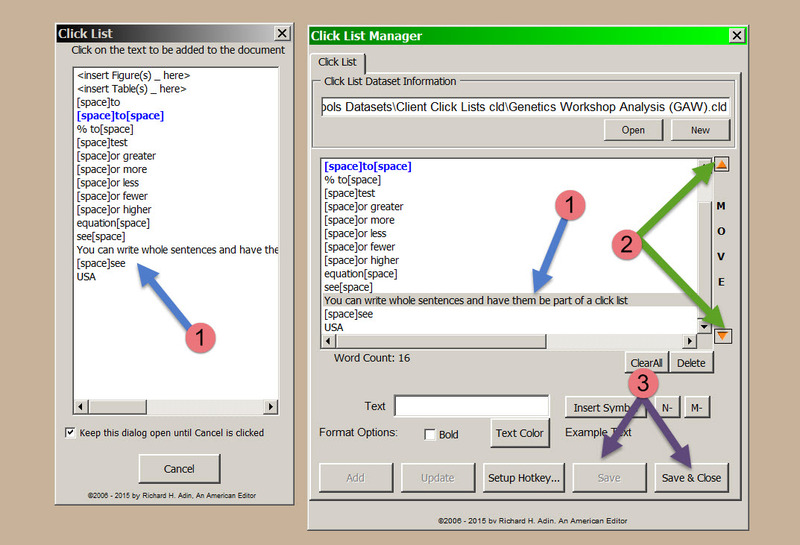 Clicking Save saves the Click List file and makes the new text available in the Click List but also keeps the Manager open so you can add additional text later; clicking Close & Save does the same but closes the Manager. In addition, you can move text up or down the list using the Move buttons (#17); the Manager also tells you how many items there are in your Click List (#18). As we have discussed many times here on AAE, the faster and more accurately we can edit, the more profitable editing can be for us. The more we have to compete for business, the more important speed becomes. The same is true as schedules become increasingly tighter. The key is to be more productive, which means more efficient, which means less typing. The more typing we do, the more errors we can introduce into a document. Consequently, the more automated we can make editing, the more accurate it will be and the greater the profit. 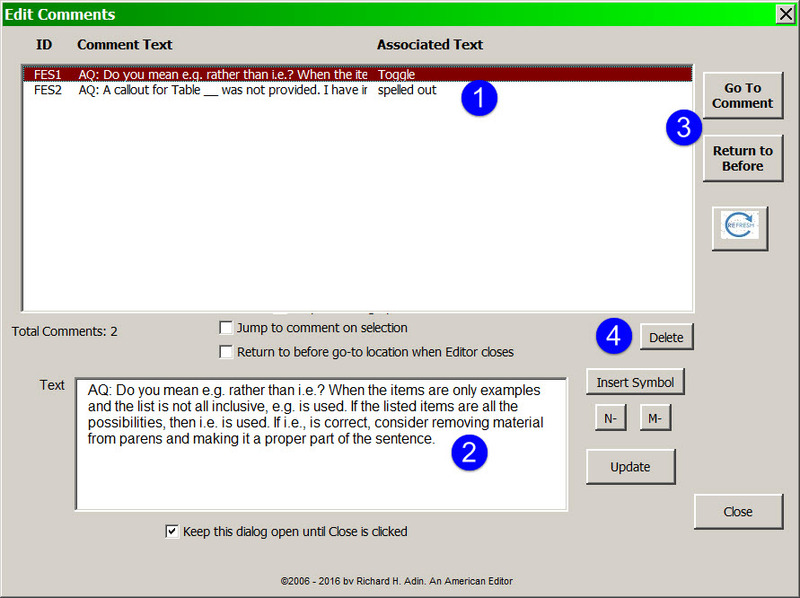 The problem was that the phrases and the references were not Toggle Word candidates because there was almost always an inconsistency or two from a previous use. The image below are samples I extracted from one chapter. 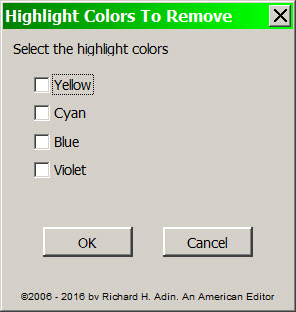 By using Click List, I was able to save a significant amount of typing time (and thus increase profitability), but, more importantly, because of the unique styling used, I was able to ensure that each instance of the book and phrase was identical to every other instance. Speed and accuracy are two components of profitability and Click List improves both. Click List is one of the three macros I keep open on my desktop as I edit, the other two being Bookmarks and Reference # Order Check. Click List can save time and can increase accuracy — it is another important tool in the editor’s armory.